Covering the latest breaking news in Google AdWords, the fifth edition introduces revised, expanded and new chapters covering Enhanced Campaigns, Google AdWord's Express, Google's Product Listing Ads, and the introduction to Google's Universal Analytics. Nuances in Big Data advertising are also revealed and expanded sections and necessary updates have been added throughout. 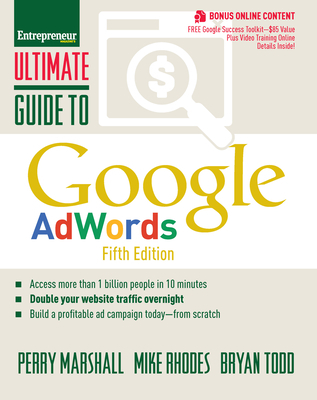 Perry Marshall is the number-one author and worlds most-quoted consultant on Google advertising. He has helped over 100,000 advertisers save literally billions of dollars in "AdWords Stupidity Tax." His Chicago company, Perry S. Marshall & Associates, consults both online and brick-and-mortar companies on generating sales leads, web traffic, and maximizing advertising results. He's been featured at conferences in the U.S., Canada, Ireland, Great Britain, Israel and Australia. He's shared the stage with Zig Ziglar, Brian Tracy, Jay Abraham, Gary Halbert, Harvey Mackay and Les Brown. He's consulted in over 200 industries, from computer hardware and software to high-end consulting, from health & fitness to corporate finance. Mike Rhodes, CEO and founder of WebSavvy, is an international speaker, bestselling author, specializing in Google AdWords, Google Analytics, and website conversions. Bryan Todd is an international marketing consultant and Google AdWords specialist.